Rio de Janeiro: Gritty woman wrestler Sakshi Malik ended India's painful wait for a medal at the Rio Olympic Games by clinching the bronze in the 58kg category, pulling off a sensational 8-5 victory over Aisuluu Tynybekova in the play-off bout. Weightlifter Karnam Malleshwari (2000, Sydney), boxer MC Mary Kom (2012, London) and shuttler Saina Nehwal (2012, London) were the only other women players from India to have won a medal in Olympics. Like in three of the four other bouts earlier in the day, Sakshi won the crucial bout after coming from behind. She, in fact, had lost 2-9 in the quarter-finals to Russia's Valeriia Koblova in the fifth bout of the day before getting a second chance in repechage when her conqueror reached the final. Sakshi's victory brought cheers to the Indian contingent that had endured agonising 11 days without a medal. 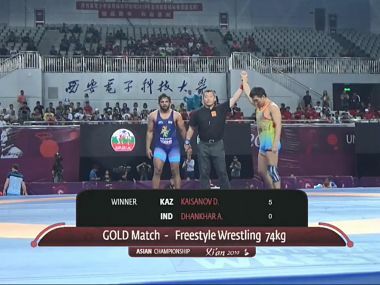 Sakshi turned the tables on the Kyrgyzstan wrestler in the dying seconds of the bout as Tynybekova was in complete command in most part of the clash. Tynybekova grabbed Sakshi's leg and quickly earned two points before adding one more for the Indian's passivity. She repeated her move and successfully bagged two more points to lead 5-0 at the break. Sakshi could open the scoring only in the second period and got two points after throwing her rival down and out of the mat. She then managed to earn two points again with a similar move to bring down the margin to 4-5. Thereafter, it was no looking back for the Indian girl and she took the opponent down to level the scores 5-5. But she did not stop there and gained three more points by pinning down the Kyrgyzstan wrestler in the dying moments of the match. She had earlier stormed into the bronze medal play-off round with a dominating performance in her repechage round, where she thrashed Purevdorjiin Orkhon of Mongolia 12-3. Both the wrestlers matched each other in the first period and the scores were 2-2 at the break. But Sakshi gave a more aggressive account of herself in the second period, pinning down her opponent from time to time, besides flipping her over for crucial points. Starting with a double-leg take down to earn two points, she added two more crucial points to her kitty to lead 6-3 with a minute left. In the last one minute, she kept attacking and gained four more points. In fact, Sakshi earned as many as 10 points compared to just one by the Mongolian in the second period to seal off the issue in style. As Sakshi had reached the quarter-finals, she needed to fight only one repechage round as compared to the other two opponents of the Russian girl, whom she had beaten in the earlier two rounds — pre-quarters and qualification. Koblova had beaten Luisa Niemesch of Germany in the qualification round before defeating Mongolia’s Orkhon in the pre-quarter-finals. Therefore, in the first repechage round, these two grapplers from Germany and Mongolia faced each other. And the winner of that bout (Mongolian girl) then took on Sakshi in repechage round 2 for a place in the bronze medal play-off. Sakshi had to get the better of the Mongolian grappler in the repechage round 2 and she did just that to advance to the bronze medal play off. In the bronze play-off too Sakshi's winning move that got her two points initially was challenged by her Kyrgyztan rival and it was reviewed and she was awarded an extra point by the judges much to her rival's chagrin. The other bronze was won by Marwa Amri of Tunisia. Earlier in the day, Sakshi went down in the quarter-finals losing 2-9 to Koblova. Having conceded one point in the first period of her quarter-final fight because of passivity, Sakshi did well to earn two points in the second period after taking-down the Russian girl. But Koblova, with enormous strength, hit back almost immediately to pocket four points and then gained another two to open up a 7-2 lead. The Russian then closed the door on Sakshi by bagging another two points to win the bout and make the semi-finals. In the first two rounds, Sakshi came back from behind to register impressive wins. Making a strong comeback from a 0-4 down, Sakshi defeated Sweden’s Malin Johanna Mattsson 5-4 in the qualification round. She was down 0-4 after the first period but quickly made amends in the second period. Sakshi managed to pull two points back before pushing her rival out of the mat to grab another point. With just 10 seconds remaining, Sakshi desperately needed one more point to post a win and she held her nerves as she took down the Swedish girl in those dying moments to post a narrow victory. In the pre-quarters, she once again eked out a narrow 5-5 win over Mariana Cherdivara Esanu of Republic of Moldova. In the opening period of the pre-quarterfinal bout, Sakshi got 30 seconds to earn points but she failed and that gave Cherdivara a point. The girl from Moldova then put Sakshi down on the mat to gain another two points and lead 3-0 at the break. In the second period, the Indian failed to take advantage of the 30 seconds she got and handed Cherdivara another point. Sakshi then came back strongly to post a double take down, which earned her four crucial points at one go and helped her surge ahead to a 5-3 lead. Although Cherdivara, with her own take-down, gained two points to make the scores level at 5-5 with just 19 seconds left on the clock, the Indian was declared winner on bigger points gain.